This is by our friends at Well Vegan blogpost. Looking for a hearty winter salad? How about an awesome last minute gift? Today, we give you both courtesy of our good friend, Vanessa Dominy. This kale, quinoa and black bean salad is just perfect as a side dish for your next gathering or as an entree on a week night when you want something something filling but simple to prepare. And the vinegar is what makes it! It’s outta control good. Make it your go to host(ess) gift this season or just buy a case for your dad. 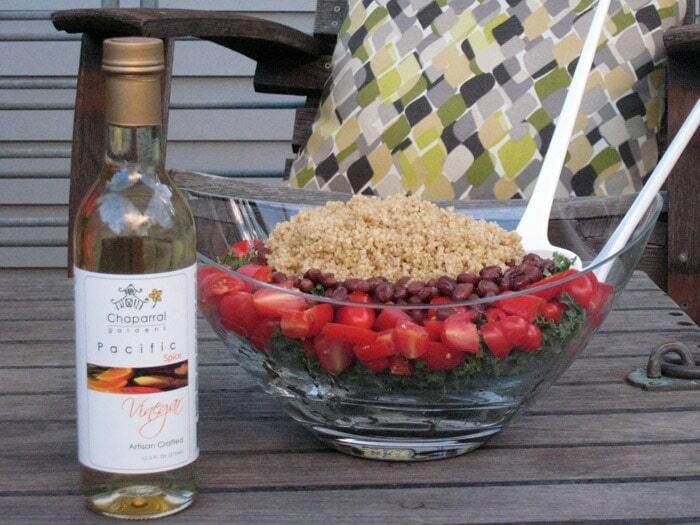 The vinegar variety used for this salad is Pacific Spice fruit vinegar made by Chaparral Gardens. Distilled with kiwi and ancho chilis. It truly makes this salad exceptional. Because this vinegar is so flavorful, the dressing requires little oil (and can be made without oil at all if you choose) which makes this a low calorie recipe as well! Chaparral Gardens is a family owned organic farm located in the California Central Coast. They start with a kosher, organic vinegar base and then distill it with various herbs, fruits and peppers that they grow themselves or acquire from neighboring organic farms. Pair that awesomeness with superpowers of kale — touted for it’s cancer preventative properties (due to its rich vitamin K, C and A content), anti-inflammatory benefits (with 45 different flavonoids contained therein) and cardiovascular support (in terms of its cholesterol lower ability). Then drop in some quinoa (tasty and a complete protein) and everyone loves a black bean. Start by cooking your quinoa and when it is done, set it aside, lid off to cool. Alternatively, you can make the quinoa well ahead of time and store in the refrigerator, or even use leftover quinoa! Next wash and pat dry kale and cut the softer curlier portion off of the center stem portion of the leaf and cut into small bite sized pieces, discard center stem portion. Chop tomatoes and then open and drain you can of black beans. To assemble (as implied by the pictures) start with the kale, then place chopped tomatoes in a ring around the outer edge, next an inner ring of the black beans and finally pile the quinoa in the middle. Kitchen note: I rather care for the hearty texture of the kale but for those of you who prefer a kinder gentler kale, dress and toss this salad 15 minutes ahead of serving and let it rest. The vinegar and lime juice help to break down the kale a bit and soften the leaves. Posted on December 18, 2013 by Well Vegan. This entry was posted in Recipe, Salad and tagged beans, Chaparral Gardens, flavored vinegar, Kale, pacific spice vinegar, quinoa, Salad, vegan.